Tiverton town centre is a mile or so west of the Best Western Tiverton a short walk across the bridge that straddles the glorious River Exe. 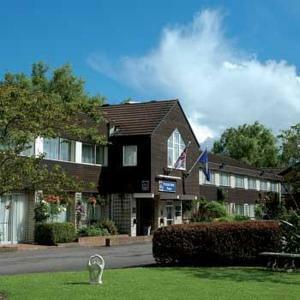 Don't let the hotels rather busy location put you off though as the property is nestled in over two acres of landscaped gardens and offers a quiet, secluded base for business travellers and families exploring mid Devon and the Exmoor National Park. Rooms are smartly presented and equipped with satellite tv and iPod docking stations as standard. Superior rooms are available with king and queen-sized beds, free wi-fi and ink-jets printers in some. There is an onsite Gallery Restaurant serving local West Country produce. Convenient for the M5 and close to Exeter and Taunton.